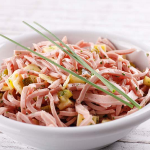 Another recipe of the famous potato salad – because you can’t get enough of it! This one’s hot – literally! Cook the potatoes over high heat in a large saucepan until water comes to a boil. Season generously with about 1 tablespoon of kosher salt. Reduce the heat to medium so that the water is still gently bubbling and cook the potatoes for about 10 minutes or until they are easily pierced with a fork and the skins are barely starting to pull away from the cut edges of the potatoes. Drain the potatoes and cool until they can be handled. Dice the potatoes and add back to the pan you cooked them in to keep warm. Meanwhile, cook the sliced bacon in a large skillet over medium heat until browned, about 5-6 minutes stirring occasionally. Transfer the bacon to a plate topped with paper towels to drain. Add the onion to the bacon grease and cook for about 3-4 minutes or until the onion is transparent but not brown. Stir in 1 cup water, the white vinegar, mustard and sugar and cook for about 5-7 minutes or until the dressing has reduced to about 2 cups. Add the potatoes back to the pan with the dressing and toss to coat. Add the chopped bacon and parsley. Season with kosher salt and freshly ground black pepper to taste. Serve warm. 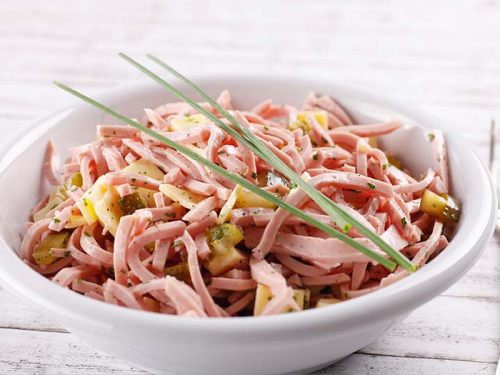 Wurstsalat is a tart sausage salad prepared with distilled white vinegar, oil and onions. A variation of the recipe adds stripes of pickled gherkin. It is normally made from a sort of boiled sausage like Lyoner, Stadtwurst, Regensburger (two types of cooked sausage) or Fleischwurst. It is a traditional snack in southern Germany. Cut the Lyoner slices into small stripes. Halve the onion and slice thinly. Put sausage, onions and gherkins into a bowl and blend. Put salt, pepper, paprika, oil and the other liquids into a shaker and mix thoroughly. Pour the vinaigrette over the sausage and blend. 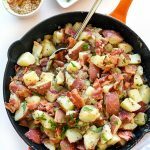 Let the salad rest in the fridge for at least 2 hours, remove it from the fridge 30 minutes before you serve it with fried potatoes or fresh German bread. 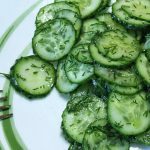 Homemade cucumber salad is a refreshing companion to any main dish, be it meat or fish, which is especially popular in summer. 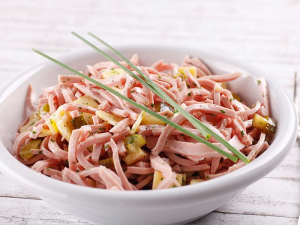 This simple German classic can be prepared with different dressings. Whether classic with vinegar or creamy with sour cream and dill, it’s a winner! Place the sliced cucumbers, dill and onions in a medium bowl. For the first version: mix together vinegar, oil, sugar, salt and pepper. Add the sliced cucumber to the vinaigrette, mix well and allow to sit for about 15 minutes before serving. For the second version: mix together the sour cream, vinegar, dill, and sugar. Pour the mixture over the sliced cucumbers and mix gently. 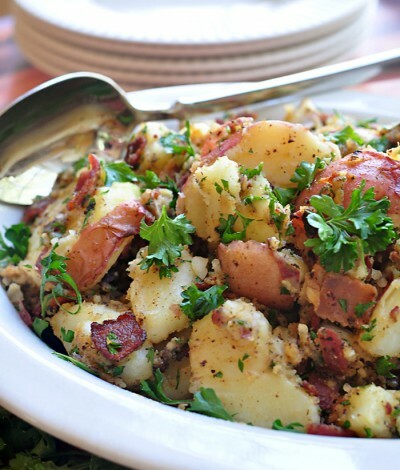 Bacon gives this warm German potato salad recipe a boost of flavor. The vinegar and sugar dressing on this salad has the perfect combination of salty and sweet. Scrub potatoes and cut any very large potatoes in half so that all potatoes are of approximately equal size. Place potatoes in a large pot and cover with cold water. Bring to a boil and stir in 1 teaspoon of salt. 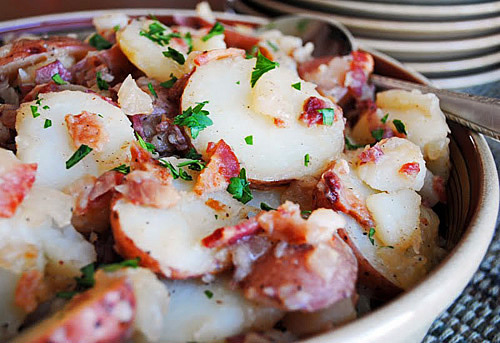 Reduce heat and simmer potatoes for 15 to 20 minutes or until potatoes are tender when stabbed with a fork. Drain water. Leaving potatoes in pot, return pot to still-hot (turned off) burner. Leave lid off of pot and allow potatoes to steam dry for a few minutes. Set a large pot over medium heat and use kitchen shears over pot to cut bacon strips into approximately 1-inch pieces. Cook bacon, stirring occasionally, until crispy. 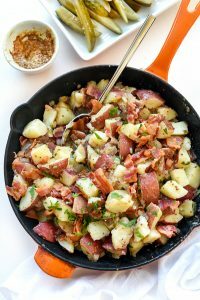 While bacon is cooking, cut potatoes into 1/2-inch thick slices. Cut any extremely large slices in half. Set aside. Once bacon is done, remove pot from stove and use a slotted spoon to remove bacon to a bowl while leaving bacon grease in the pot. To the bacon grease, slowly and carefully add vinegar, sugar, Dijon, salt, and pepper. Place the pot back on burner, bring mixture to a simmer, and stir for a couple of minutes. Stir the minced garlic into the mixture and cook for 30 seconds to 1 minute, or until garlic starts to turn light golden. 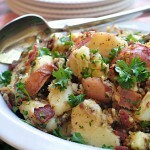 Remove the pot from heat and toss in the sliced potatoes, gently mixing until potatoes have absorbed all of the liquid. Carefully fold in the cooked bacon pieces and chopped parsley. 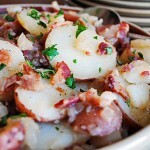 Transfer potato salad to a serving dish and serve hot or warm. Peel the white asparagus (green asparagus does not have to be peeled), cut off the woody end and cut into 7 cm pieces. cut each piece in half or quarters, lengthwise. Alternatively, cut off the tops, slice in thin strips like ribbons and cook as follows. Bring a pot of water to a boil and add the salt, sugar and lemon slices. Reduce heat to a simmer and add the asparagus for 3 – 6 minutes, or until they are soft enough for your taste. Remove from the water, reserving several tablespoons of water, and cool them in a cold water bath. Remove from the cold water and drain well. While the asparagus is cooking, wash and dry the arugula or lettuce and remove any hard stems. 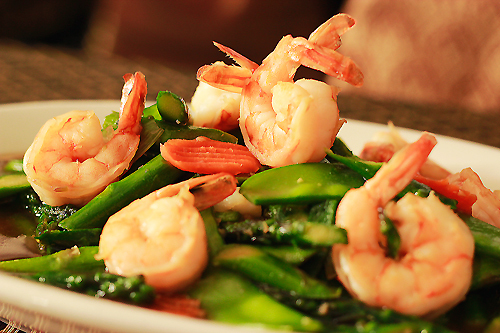 Cook the shrimp in an oiled pan until pink, two to three minutes. Make the vinaigrette by mixing 2 tablespoons of chopped lemon balm, 3 tablespoons of the asparagus’ cooking liquid, the balsamic vinegar, honey and oil with a whisk until thick. Season to taste with salt and pepper and perhaps a bit more honey. 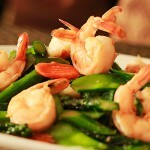 Arrange the arugula on plates, add the asparagus and several shrimp. Drizzle the dressing over all. Garnish with lemon balm and serve with baguette.